A former banker has gone on trial accused of swindling north-east pensioners out of thousands of pounds. Aditya Rajiv allegedly hatched a plan while working for the Royal Bank of Scotland (RBS) in Aberdeen to fleece four of his customers out of a total of £7,500. It is claimed on one occasion Rajiv, who was working as a retail assistant, set up online banking for an 82-year-old lady – who had never used a computer in her life. It is alleged he used the online account to drain £1,000 from her savings, before redirecting it into a PayPal account. The 28-year-old is also accused of targeting a retired couple, and taking a further £1,000. And it is alleged he defrauded Douglas Davidson out of £5,500 in a similar way. All four complainers claim their accounts were plundered through payments to a PayPal account they had no knowledge of. Rajiv denies the three charges against him, and yesterday went on trial at Aberdeen Sheriff Court. Giving evidence yesterday 82-year-old Mable Moore said she had been on holiday in Prague visiting her son when she was informed her account had been “dipped”. She said when she returned home and checked her statements there was £1,000 which had been spent on “a suit” purchased using PayPal. She said she had never used or even heard of the payment system before. The court heard Mrs Moore always used the bank on Union Street and would only ever withdraw money by going into the St Nicholas branch. Mrs Moore said that shortly before her trip abroad she had an appointment with Rajiv to discuss taking out a life insurance policy. She said during that meeting she discussed the details of her holiday, but said she had not given permission for him to set up an online bank account. She said she had never used a computer in her life and said she had “no need” for the service as she always carried enough cash with her when she was abroad. 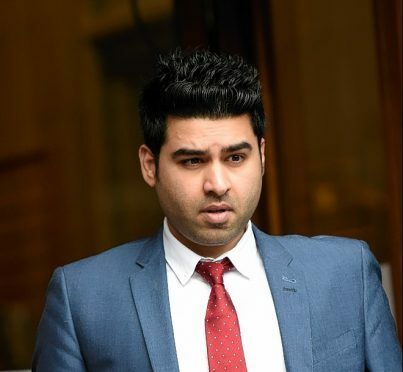 During cross-examination, Rajiv’s solicitor Andrew Ormiston put it to the grandmother that his client had set up the account with her knowledge so her son could check her funds while she was away. He said: “As part of your discussions do you remember there was a conversation about how you could check your bank balance while you were away? “As a result of that, Aditya offered to set up internet banking for you so that your son could check your bank account. Elizabeth Simpson, 74, also gave evidence yesterday and said she had met Rajiv to discuss releasing equity on her home shortly before £1,000 went missing from her account. She said he had been “charming” during their meeting but had not been able to provide her with a deal suitable for her and her husband. The court heard that when police went to search Rajiv’s home, listed in court papers as the top right flat at 163 Hardgate, Aberdeen, they discovered personal banking information of customers in his bedside drawers. An agreed joint minute also stated that account numbers and sort codes of other RBS clients were found saved to the notes section of his computers. Giving evidence yesterday Steven Beveridge, a former investigator in security and resilience at the bank, said he had started looking into Rajiv’s behaviour at work before the allegations of fraud emerged. He said they had been informed there may be a problem with Rajiv’s working visa and that he had been suspended as a result. The court heard that on the run up to the dates in July 2013 when the cash had been removed from the accounts, Rajiv had viewed the details of Mrs Moore and Mrs Simpson’s accounts numerous times while he was at work. Mr Beveridge said the volume of views was “way in excess” of anything he would normally expect from a member of staff carrying out work on behalf of a customer. Mr Beveridge was also asked about the files and customer details found within the accused’s home. He said this was a severe breach of company policy and that, even if a member of staff was required to work at home, he would be given a secure server to work on. He said in no circumstance should anyone have unsecured bank details of customers in their homes. The trial, before Sheriff Edward Savage, was adjourned until next month.